It is a month today since Ratan Tata retired as chairman of Tata Sons. Mr Tata tweeted last week that he is enjoying his retirement and the time he spends with his beloved dogs. We studied together at St Mary High School (Mazagaon, south Mumbai ). He was in my brother’s (Zarin Mehta, former executive director New York Philharmonic Orchestra) class. Two years younger. I was two years ahead of him. I went to Vienna to study and he continued his studies. He was a very sweet, good looking, good natured. I remember going to his grandmother’s (Lady Navajbai Tata, a director on the board of Tata Sons) house for his birthday parties. Grand old lady. His father Naval Tata was a good friend of my father’s (distinguished musician Mehli Mehta). When I came to Bombay again in 1967, for the first time with an American orchestra, it was his father who hosted us and was very kind to me. After school we were out of touch because I left the country. 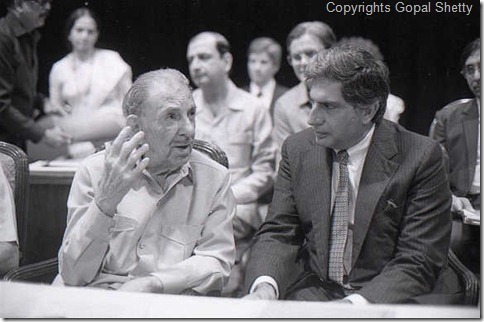 (I got back in touch with Mr Tata again) when I used to come to Bombay. Then we always met at my concerts, after concerts or at friends’ homes. especially Nusli Wadia (chairman, Bombay Dyeing), who is on his board and one of my best friends in Bombay. We meet with Dr Yusuf Hamied of Cipla. And, of course, the ladies who organise my concerts, whose chairman is Mrs Mehroo Jeejeebhoy (founder trustee, the Mehli Mehta Music Foundation). She is a common friend. We are related (through) friends. We can’t get away from each other! It has always been an amicable friendship. Not a very close friendship. But I think I spoke to him yesterday (laughs). He always came to my concerts when I was in Bombay. He has always supported me when I came with (various) orchestras. Because we always needed contributions and he has been very generous. (Is Mr Tata a fan of his music?) Yeah, I suppose so (laughs heartily). Whenever I come with the Israeli Philharmonic or the Florence orchestra he has always supported us. His Taj hotel has been very kind to us also, because of his input. I catch up with him mostly in Bombay. I was (living) in New York mostly through JRD’s (the legendary Tata chairman J R D Tata) chairmanship. So I would meet JRD when he came for his meetings or whatever. But when Ratan became chairman, that was when I left New York (and did not get an opportunity to meet him when he came to New York). He has always been very generous. Remained a loyal friend. Always helpful, whether I asked him for help to produce the concerts of mine. For all our concerts the monies went to charity. He was very helpful on each occasion. Quiet. Unassuming. Never gave you the airs that he was the chairman of one of the biggest companies in Asia. You never feel that with him. You can sit down and talk to him about anything. And he never talks about himself. He was kind when I presented my book, my autobiography. It was presented at the Taj, by the publishers. He came and sat with my wife. I was so surprised — a busy man like him to come to a book presentation. I was very moved and touched. I am a musician. And he is a super businessman. Look at what he has done. Bringing in Jaguar and Corus. He expanded it (the Tatas) into a world company. Today anywhere in the world you talk about India and people mention Tata. Now that he is retired I hope I will see more of him in Europe. In fact, he told me he would have more time to travel now and he won’t be as constricted with business matters etc. So I hope I see him more in Europe now. I wish his charitable activities will continue. Of course, I don’t think his influence over his company will just suddenly eradicate. I am sure he will be a sort of holy ghost over the whole company.